Tue, Feb 12, 2019, 08:03 am SL Time, ColomboPage News Desk, Sri Lanka. Feb 12 (DC) Rameswaram- At least 25 Sri Lankan Tamil families staying the in the largest camp for them at Mandapam camp near here for long years have petitioned the special deputy thasildar in-charge of the transit camp, Mr. Ramachandran, stating they wish to get back to Sri Lanka as early as possible. This is reflective of a wider trend found among over 7,500 Sri Lankan Tamil refugees who have been staying in various camps across Tamil Nadu, with many of them voicing their preferences to get back to Sri Lanka on the ground that “political normalcy is slowly but surely returning to the Island-Republic”, a decade after end of the “civil war” between the Island's armed forces and LTTE in 2009. In Mandapam transit camp, the largest for Sri Lankan Tamil refugees in Tamil Nadu, many of them have been frequently transiting between their home towns and native villages in Northern Sri Lanka and here. The total number of inmates in this camp has now come down to 1,641 inmates, who include 630 men, 659 women, 168 boys and 184 girl children. 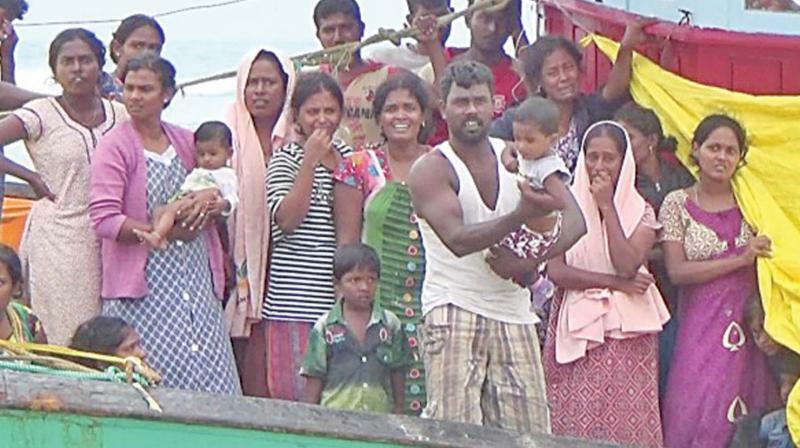 While some among them are in a position to obtain passports in Chennai for their return travel back home, those Sri Lankan Tamil refugees unable to take that route are urging the Tamil Nadu and Indian governments to make arrangements for a ship that could ferry refugees desiring to return home in larger numbers. These sentiments were expressed by some of the Tamil refugees spoken to by DC at the Mandapam camp. “My family came here as refugees in 1990 and have been staying in Mandapam camp since then; my son is now in Sri Lanka and things are getting better there. Hence we want to return to our motherland. I am now planning to go to Chennai to get a passport,” said Filomina, one of the refugees. Merina, a third Sri Lankan Tamil who came here as refugee in 2006 from Mannar, cited “political changes taking place there which are creating a conducive atmosphere for us to return home; my mother and other relatives are there and only some of us are here; since we do not have the means to obtain a passport, we are ready to leave if the government helps to organise a ship to enable mass transit.” Such is the mood among the Tamil refugees in the Mandapam camp.